The sole purpose of the tea kettle is to boil water. Water for coffee and for many cooking uses does not have to be boiled, but fresh, cool water that is brought fully to a boil is essential for tasty tea. Although it is associated with making tea, the kettle's contents make excellent instant drinks or soups that are also best with boiling water or to produce steam for remedying colds. Tea itself has been processed into three different forms in its history, making specific utensils essential. In its beginnings in China, tea was processed in blocks or cakes that had to be boiled after roasting and shredding; this required a tea kettle. The Japanese method was more refined; powdered tea was whipped in porcelain bowls with bamboo whisks. Leaf-tea (the most common form in the Western World for about 200 years) consists of different methods of picking and processing tea leaves. This tea requires steeping in boiling water, so leaves are put in pots filled with boiling water from the tea kettle. Block, powdered, and leaf tea must all be steeped in boiling water. The tea kettle evolved from the cooking kettle that was hung on a hook on an iron post in the cooking fire. The hook was turned to move the kettle over the fire, and a "tilter" helped to pour water from the kettle. Kettles were made of iron, one of the first metals to be mined and processed. In Japan, the iron cooking kettle became a small, rounded bowl with two short arms or loops (one on either side of the bowl) for pulling it off the hearth and a lid. A classic example of a bowl-type iron kettle dates from 1517. As methods of casting iron became more sophisticated, the outsides of these kettles were decorated, and the two arms became a spout and better handle. Iron casters who made tea kettles were highly respected. Beautifully decorated examples of Japanese iron tea kettles with the spouted tea kettle shape known today date from the late nineteenth century. Iron kettles could withstand cooking fires, but serving ware emerged from the porcelain industry. Kettles obviously existed before tea pots because pots copied the shape, spout, and handle. In Russia, water is heated in a samovar (literally, self-boiler), which is not a tea pot but an elaborate tea kettle made of metal with a central chimney for containing fire and boiling water in the surrounding vessel. Russians learned about the samovar from Persians during border disputes and trade efforts. A strong concentrate of tea is kept in a tea pot and warmed constantly on top of the samovar. Concentrate is poured into tea cups, and boiling water from a spigot on the samovar fills the cups and dilutes the concentrate. The English began making tea pots of unglazed earthenware in the mid-seventeenth century, but silver became a popular material in the early 1700s. The first known silver tea pot is dated 1670, but, by the turn of the century, all tea servingware was made of silver including kettles. Silver kettles are still made today, but they have been surpassed in importance by aluminum and stainless steel for both stove-top and electric types. In both England and the United States, the tea kettle's development was closely linked to the evolution of the stove. When stoves replaced cooking fires, the kettle was pulled from the fire and given a place on the stove. Most kettles are shaped like modified globes with flat bottoms to sit on stove plates. Kettles became ornaments for kitchens when they were manufactured with different metals like copper and decorated with interesting handles and enamel. Electrifying the kettle followed in the early twentieth century. Although the first kettles were seated on individual electric coils, heating elements were soon built in and more refined models appeared. Electric tea kettles are made predominately of steel, iron, silver, aluminum, or a combination of plastic and metal. High-grade steel is typically used for the housing of all-metal kettles. Heat resistant plastics, such as low density polyethylene (LDPE), polypropylene (PP), or polystyrene (PS), comprise the upper housings of the kettles in some models with metal enclosures on the bases that contain the heating elements. Depending on the quality of the kettle, the types of raw materials can vary greatly. For higher grade kettles, a higher grade of steel or even silver may be used. Lower quality kettles may be of simple aluminum. Ideas for electric kettles arise from several different sources. The Research and Development (R&D) Department in the manufacturer's firm develops its own concepts for entirely new designs and for freshening its existing models. Fashions for cookware and other kitchenware change along with many household conveniences and accessories. Fashion is not limited to color but includes up-to-date overall shapes, changes to parts such as bases or handles, and improved safety features. 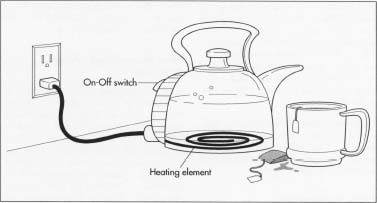 The electrical components of a tea kettle include the heating element, a thermostat that turns off the kettle automatically if it is boiling dry, an on-off switch and its attachments, a connection linking the element to the cord, and the plug. These are received at the plant as assembled units. Their assembly is out-sourced (subcontracted) to other factories, often outside the United States. These manufacturers further subcontract the making of individual electrical parts. Metal is received at the tea kettle factory in sheets or rolls appropriate for presses that will stamp out the parts. Stainless steel sheets are checked for thickness; a bill of lading specifies the alloy, but the receiving department checks the thickness of the steel with precision instruments. Polypropylene plastic that is usually heat reinforced is delivered as tiny pellets in the color the kettle manufacturer requests. Plastic pellets are randomly inspected for color and impurities. From large hoppers above the injection molding machines, the pellets flow into the machines by gravity. The electrical components are complete when they are shipped to the plant. One set per tea kettle is provided as a bundled or wrapped set; parts do not need to be sorted or assembled. The receiving department randomly inspects and tests some of the electrical sets. In the factory, the sheet steel is mechanically placed in the die of a punch press. A hydraulic punch is released, creating a hollow shell in the shape of the kettle base. This piece is then removed. The second sheet of steel is placed in a punch press with a die shaped to hold the heating element. The steel shapes are called stampings. One piece forms the base of the tea kettle and the connector between the element and the cord. The second piece sits in the first like one bowl inside the other. A standard electric tea kettle. stampings a small electrical charge that attracts the coating. Meanwhile, the upper part of the kettle is formed. The polypropylene plastic pellets are released through a hopper with a funnel-shaped bottom into an injection-molding machine that melts the pellets under high heat until the plastic is liquid. Under high pressure, the liquid plastic is forced into a steel box (called a die) with two halves. When the halves are locked together, the die contains a void that is an exact image of the plastic housing of the kettle. The two parts in the die form the outside and inside surfaces of the kettle. The cavity relief surface of the die shapes the outside of the kettle including the solid plastic handle, and the core relief surface is the inner surface. When the injected plastic has filled every tiny nook in the die, the die is opened and the plastic kettle housing, which is still hot, is ejected. The housings are allowed to cool until assemblers can handle them. The painted and treated metal stampings are welded together to form the base of the kettle. The two major processes—injection molding and the punch press—allow large quantities of these to be made continuously. The kettle base is then placed on an assembly line conveyor belt, then equipped with power components at a workstation where the electrical set is removed from its packaging, and an assembly worker manually sets the connector between the heating element and the cord into the shaped opening in the base. The kettle's rubber feet are also attached to the base. The metal base (with its electrical components in place) and the plastic housing are sealed together to complete the tea kettle body. At the next assembly station, metal flip-up covers are manually pressed onto the plastic spouts so the spouts will open and pour water; these wide spouts are also the openings for filling the kettles. Other models have metal lids with small plastic handles that are also injection molded. These models are filled through their opened lids. The completed kettles are conveyed to the shipping department. Each kettle is wrapped in a plastic bag that also contains the instructions and boxed. The boxes are packed into shipping cartons. Electric tea kettles are the subject of quality control in multiple locations in the factory. The steel and plastic materials are prepared, tested, and examined for any defects such wear, discoloration, or scratches. The sets of electrical components are also inspected in the subcontractors' factory where they are made. Underwriters' Laboratories must also test and approve electrical components before they become parts of larger products. At the manufacturer's plant, electric tea kettles are subjected to multi-tiered inspections that begin when all materials are received and continue through each manufacturing step. As a final quality check, each tea kettle is plugged in and operated before it is packed for the customer's use. Metal and plastic wastes result from handling and processing both materials. Metal waste is steel only and trimmings are sold to iron or steel foundries. Plastic trimmings or flawed molded parts are reground and recycled. Only a small percentage of reground plastic can be used for other tea kettles in order to maintain the high quality of the plastic housings, but the remaining plastic can be used in other products. The future of electric tea kettles is in the hands of consumers and retailers. Retailers provide sales data, consumer comments, and other input to the manufacturers. This information helps the producers to decide on new designs. Stove-top tea kettles have always had stronger sales figures than electric kettles, but electric models also have a devoted public. The recent popularity of tea and flavored teas has awakened interest in electric tea kettles. Tea infusers and electric tea makers with water filtering systems are the newest ideas in this area of manufacture. The British have pioneered both of these developments that look something like coffee makers with glass tea pots above heating chambers. Unlike coffee makers, these appliances heat the water until it is boiling, which is a must for tea. A filtering system has a filter as a third layer or as a column on the back of the maker, and some can be connected directly to water faucets. These devices seem to point to the future of electric tea-making, but their stacked structure looks curiously like that Persian invention. Huxley, Gervas. Talking of Tea: Here is the Whole Fascinating Story of Tea. Ivyland, PA: John Wagner & Sons, Inc., 1956. Kakuzo, Okakura. The Book of Tea. Rutland, VT: Charles E. Tuttle Company, 1972. Papashvily, Helen, and George Papashvily. Russian Cooking. New York: Time-Life Books, 1969. Pettigrew, Jane. Tea & Infusions. Carlton Books Limited, 1999. Von Bremzen, Anya, and John Welchman. Please to the Table: The Russian Cookbook. New York: Workman Publishing Company, Inc., 1990. "About Tea Kettles." Kyoto National Museum Web Page. December 2001. < http://www.kyohaku.go.jp/mus_dict/hd11e.htm >. Calphalon Corporation Web Page. December 2001. < http://www.calphalon.com >. Nezu Bijutsukan Museum Web Page. "Tea Kettle of Shinnari Type." December 2001. < http://www.nezu-muse.or.jp/99-10-03/30187_e.html >. TenRen.Com Web Page. December 2001. < http://www.tenren.com >.